I imagine it takes a lot of patience for normal people to travel with a book nerd. First, there’s the book nerd’s tendency to read too much and too long, perhaps missing some key landmark as the train speeds by. Then there’s the tendency to blurt out random tidbits of esoteric allusions sparked by road signs. (“GHENT: I wonder if they’ve got the good news!!! HaHa.”) But perhaps the single biggest hazard of travelling with a book nerd is that while other people like to check out things like night life or shopping when they visit new places, a book nerd wants to check out things like the library or authors’ homes. This explains how my travelling companion was surprised to find himself browsing the stacks at THE Carnegie Library in Pittsburgh or taking photos with a cardboard cutout of Jane Austen in Bath, England. 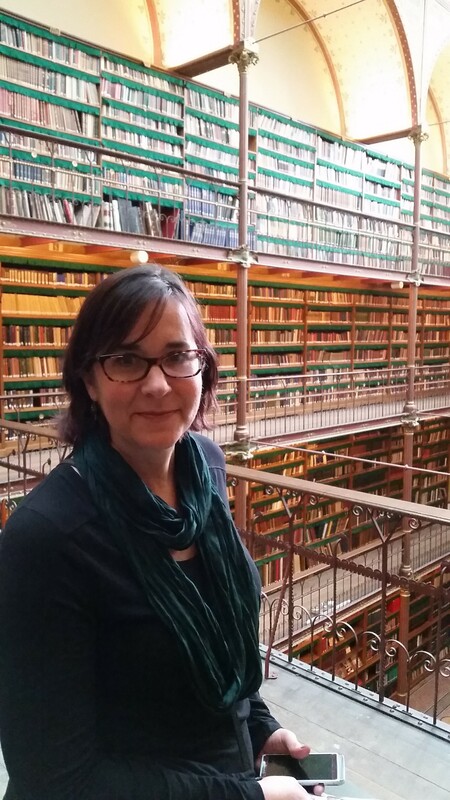 Last month my traveling companion and I were especially book-nerdfully lucky when we spent a week in Germany and the Netherlands. In Heidelberg, Germany, we stayed in the sunny Hotel Acor, and on our short walk to the historic quarter, we would pass right by the Universitatsbibliothek Heidelberg – the University of Heidelberg Main Library. 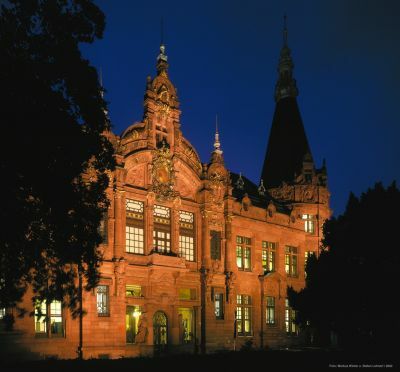 Heidelberg is one of the oldest universities in Europe and its library dates back to a 1388 purchase of a chest of documents. Today’s library building is more recent, of course, but I still felt a strong sense of continuity when I went through its doors. It was kind of spine-tingly to think of people like Goethe and Mark Twain sharing the same intellectual space. It was kind of encouraging to see students hurrying to class in the same frenetic way college students do everywhere. It was as if there were a connection spanning both time and place, a metaphysical grid generated by wondering and reading and exploring ideas. 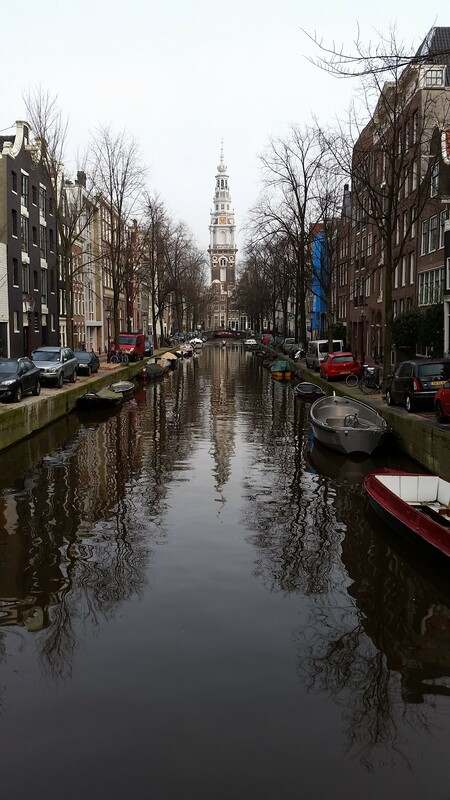 One of Amsterdam’s beautiful canals. Global trade helped shape this port city’s acceptance of other cultures and ideas. 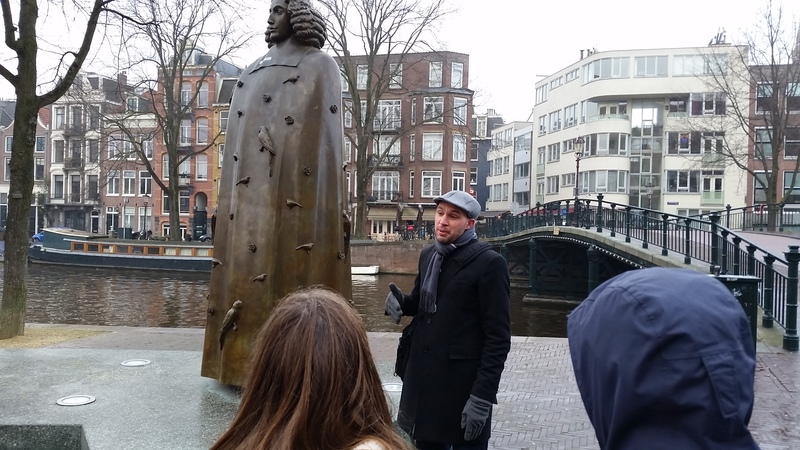 Tijs of Free Walking Tours Amsterdam in front of a statue of the philosopher Spinoza. 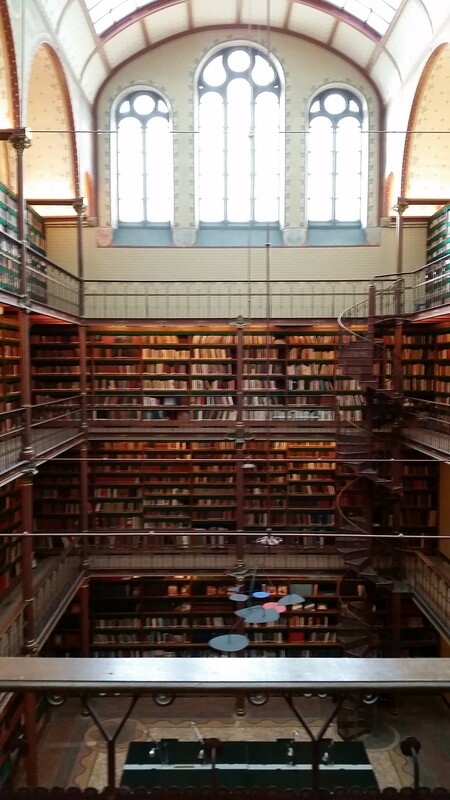 Another day, we visited Amsterdam’s iconic Rijksmuseum, which not only houses the paintings of the Dutch masters, but also has one of the most beautiful libraries I’ve ever seen—open, bright, multi-storied, with whimsical mobiles and an airy spiral staircase. Even more impressive, though, was my visit to the Anne Frank House. Before the visit, I somehow thought of the house as more of a history museum rather than an author’s home. Of course I knew Anne Frank was a writer, but I never realized just how much she identified as a writer until I was in her home. Writing was her calling and in her short life she created a whole body of work beyond her famous diary, including essays and stories and the first draft of a novel. Moreover, her famous diary was much more than a teenager’s journal. The facts and context of the story are not the sole reason its author is famous. 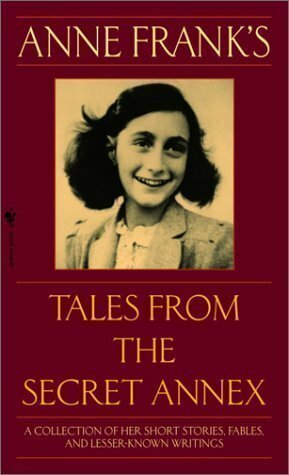 There are many holocaust memoirs and while all are precious, Frank’s is a deliberately crafted work by a skilled artist. And there’s a story behind how it came to be just that. In 1944, while in the Secret Annex, the Frank family heard a radio broadcast by Gerrit Bolkestein, minister for arts, education and science for the exiled Dutch government in London. He encouraged Dutch citizens to write about their wartime experiences and to send them in after the war. As a writer, I can imagine the excitement this request caused—the kindling of hope and purpose and meaning. Frank began to spend more and more time and energy on her writing. Because her documents are preserved, it is possible to see the evolution of Anne Frank the writer and it’s something to behold. I no longer think of her as an emblem for the horror that happened to so many young lives; instead I respect her as an accomplished author. This collection features writing other than the famous diary. The museum did an admirable job of highlighting this aspect of her story. Frank’s words were prominently displayed throughout the house and the depth of understanding and eloquence in them was quite moving. I felt privileged to be in the space where they were forged, and it struck me as completely perfect that this space was protected by the bookcase that served as a secret door. As is true for all great authors, Anne Frank used humor deftly and was a keen observer of human foibles. She also pulled from a deep well of optimism. Largely because of that, visiting the house was not a morbid experience at all. It was, in fact, the opposite—uplifting and inspiring. The theme for the exhibits when I was there was a quote from Emma Thompson’s speech last year—“All her ‘would haves’ are our real possibilities.” It was a fitting sentiment. I was just really deep-down happy and comfortable knowing that I’m the kind of person who is glad to wait for the incredible writer Anne Frank. Don’t forget to support a book nerd by buying my book, The Button Collector. 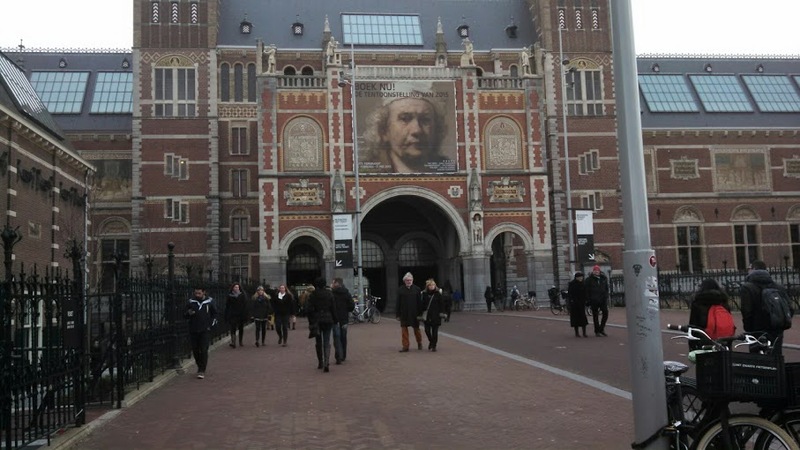 This entry was posted in Uncategorized and tagged amsterdam, anne frank, author, book nerd, carnegie, heidelberg, jane austen, library, rijksmuseum, spinoza, travel, writing. Bookmark the permalink. Enjoyed reading your post, Elizabeth. As a fellow book nerd, I can’t wait to hear more about your adventures. Elizabeth-You see the world as I would like to. Keep posting!